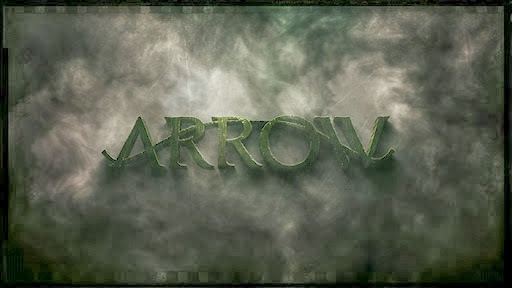 Back of the Head: Arrow 2x9 - "Three Ghosts"
"Three Ghosts," two deaths, one amazing reveal of a Big Bad One-Eyed Wolf, and the birth of a new superhero unexpectedly happening here and not in his own pilot -- Arrow's midseason finale was an evergreen giving tree of nerdy goodness. Considering his prominence in last week's "The Scientist," it's somewhat surprising how Barry Allen disappeared for much of the episode, shifting the focus squarely on square-jawed Oliver once more. Barry heroically saved Oliver's life from mirakuru poisoning by ingeniously using rat poison to thin the maple syrup his blood was curdling into. Rat Poison: The Cure for the Common Mirakuru. I guess Oliver thought Barry would choke in his big hero moment, judging from how he choked Barry when he came to and then yelled at Felicity for giving away his secret. (Later, Oliver de-hoods himself in places where his identity could easily be seen by others, like right after landing on the ground after repelling from a rooftop meeting with Quentin Lance.) "Never meet your heroes," Felicity wisely advised Barry as Oliver was summoned back to Stately Queen Manor by mother Queen's text message. Barry's main purpose for the rest of the episode was to wait around for the results of Oliver's blood analysis. He used that idle time to flirt with Felicity and dig around her actual feelings for Oliver Queen, "a billionaire by day who saves the city by night." "Sounds like you want to date him," quips Felicity in the zinger of the night. ("Lighting my menorah" on Christmas is a close second from Ms. Smoak.) Barry also congratulated himself for his accurate guesses last week about why the Vigilante wears green and that he has partners. "He likes to be called the Arrow now," Diggle points out, which is news to me since I believe that's the first time Team Arrow acknowledged what everyone else has been calling Oliver's nom-de-hood for weeks. Barry finally returns to Central City without fanfare, but leaving behind a Christmas present for Oliver: a mask! Finally. One made of micro fibers that will perfectly conform to his facial structure and won't block his vision. The greasepaint/guyliner the Arrow wears is now gone in a flash. During his quest to find the super powered brute Cyrus Gold, who is a fan of the poem about the seven stages of life that begins "Solomon Grundy was born on a Monday..." Oliver, the Ebenezer Scrooge of Starling City, is visited by the three ghosts of the episode's title. All of these ghosts represent Oliver's survivor's guilt, as diagnosed by war veteran Diggle. The first ghost was Shado, who visited him in Stately Queen Manor and urged him to live a real life, lest all his loved ones die. (Thea overhead Oliver talking in the hall but conveniently didn't hear him talk about wearing the hood to honor Shado and Yeo Fei's memories.) The second ghost was of Slade Wilson, who dropped by the Arrow Cave (after making a cameo during a rooftop exposition moment between the Vigilante and Quentin Lance). Ghost Slade tore Oliver a new one for being a weakling and a coward before he attacked Oliver and tore up the Arrow Cave. But since it was just a ghost, it was really hallucinating Oliver who was flinging himself through the glass display cases for his Arrow gear. Or was it...? The final ghost was by far the best and most unexpected ghost: during his climactic battle with Cyrus Gold after confronting the masked Brother Blood for the first time, Oliver was defeated until the ghost of Tommy Merlyn(!) appeared to forgive Oliver, tell him he's really a hero, and urged him to get up and fight the way the ghost of Mickey did for Rocky Balboa. That was the best. What a great surprise to see Colin Donnell again. Tommy Merlyn is magic and a happy Christmas miracle (or mirakuru) from Arrow to us. Oliver blames himself for events in the present and five years ago on the Island that resulted in tragic deaths. In his questionable mental state, since there was nothing wrong with his blood work and his hallucinations were all psychosomatic, the Arrow asked Officer Lance to take on Cyrus Gold for him. Lance gets his old partner played by Roger Cross to help him go after Gold for old time's sake. I'm not sure we ever learned his full name before; it's Lucas Hilton. The team of Lance and Hilton had the misfortune of adding Brother Blood's man Officer Daily to their unit. Via Daily, Gold knew the cops were coming and slaughters them, murdering Hilton in cold blood while Lance is grievously injured and hospitalized. RIP Detective Lucas Hilton, we hardly knew ye. As for five years ago on Lian Yu, Anthony Ivo procures himself his long-awaited box of 70 year old mirakuru and takes Sara, Shado and Oliver prisoner literally over Slade's dead body. When Sara pleads for their lives, Ivo forces Oliver to choose whether Ivo will execute Shado or Sara. Oliver couldn't choose between these two hot girls he boned within the last year, and how could he? We waited for Slade to miraculously revive, his blood coursing with super soldier mirakuru, to save Oliver and the girls. But it doesn't happen, or doesn't happen soon enough, and KABLAMMO! This is how Shado dies! Cap popped in the head by Ivo. Shado died on the Island like her father. Slade does revive and delivers serious deathstrokes to Ivo's band of pirates, but he is far too late to save his beloved Shado. "WHY?" Slade demands in agony. Sara, thinking quickly to save her and Oliver's lives from Slade's fury, smartly puts it all on Ivo and throws him under the bus. The wheels of Arrow's supporting cast who are unaware of the word 'mirakuru' (until Roy Harper discovered the word) kept turning. Oliver finds Roy with the arrow he placed in Roy's leg the night before in agony on Thea's bed, and Oliver tried his best to act surprised. Since he put the arrow there, the least Oliver could do (his words) was remove the arrow, and then awkwardly make excuses for why the Vigilante might have felt the need to do such a thing to innocent young Mr. Harper. Thea and Sin take the Case of Sin's Dead Friend and The Mysterious Blood Bank to Laurel, who used her Assistant District Attorney powers to look into the case and came up empty, except for a lead on psych tests all donors at the Blood Bank underwent. Laurel then went on a strange date with Sebastian Blood (he asked her if she was okay once, she ran away because her father was in the ICU. He asked her a second time, he got a hug. Note: Always ask Laurel if she's okay twice an episode.) In the hospital, Laurel had another touching scene with her father. Katie Cassidy's best scenes are always opposite Paul Blackthorne. The Lances bring out the best in each other. Meanwhile, injured Roy decides to hobble into the psychologist's office and curiously found people dousing it with gas cans to set it on fire. As he tried to escape to the safety of a dark alley, Roy is clotheslined by Solomon Grundy and soon finds himself tied to a chair in the lair of Brother Blood. Too late to stop Blood from sticking Roy with something pointy, the Arrow Merlyn's up and destroys the centrifuge, injuring Cyrus Gold and chemically deforming him to now resemble the comic book zombie version of Solomon Grundy. Oliver de-hoods again as he tries to resuscitate Roy, who's bleeding from a different orifice than usual, his eyes. But the mirakuru didn't kill Roy, like it didn't kill Slade. Next thing Roy knows, he's safe in Thea's bed, free to not explain to her where he's been, and he's perfectly clean and blood-free. Did Oliver give him a sponge bath in Thea's bed? Why was that scene left on the cutting room floor? But now Roy has mirakuru super strength. In Oliver's words, Team Arrow will need to keep a close eye on him. To keep Arrow's grateful fanbase warm until January, Arrow unloads a quiver-full of endings Return of the King-style. The Arrow gets his mask. Felicity gets a promise that if she ever decided to walk away from Oliver, Barry would light her menorah. Roy finds his leg mirakuru-ly healed from his arrow wound. But here are the important endings: Brother Blood reports to his benefactor and by his smoky New Zealand accent we know right away the man pulling Blood's strings is none other than Slade Wilson himself! Not only is Slade in Starling City and has been for some time, but he seems to be a wealthy tycoon. Slade makes his intentions clear, to corrupt and destroy every aspect of his "friend" Oliver Queen's life and loved ones until there's nothing left, and then "I'll put an arrow in his eye!" And if that weren't enough to leave us foaming at the mouth until January, lightning strikes! Barry Allen returns to his lab in Central City during a lightning storm, naturally, where he watches STAR Labs finally turn on their particle accelerator, only to watch it explode, blaze into the sky, and then send a bolt of lightning into Barry's lab to strike Barry! Thus is born the Flash. Arrow. A superhero mirakuru on television.